Mr. Fisher was born in Carlton in 1894 to William and Martha Fisher. Ray enlisted in the Australian Imperial Forces on 30th July 1915, and embarked on the HMAT Warilda on 8th February 1916 where he saw action in Belgium, and at the Western Front in France. During his time away he was promoted to the rank of Sergeant. In 1919 he was awarded the ‘Meritorious Service Medal’ for bravery under shell fire for protracted periods, and for his excellent leadership in the attack on Montbrehain on 5th October 1918. Ray returned home from active service in 1919. Ray married Elsie May Dusting in 1920, and they had one child, Marjorie Edith, who was born in 1925. Marjorie married Kenneth Graydon in 1947, and they had two daughters, Rae and Susan. In the early 1930’s, Ray established the company RMS Pty. Ltd., at 194 Riversdale Road Hawthorn, which he maintained until his retirement. Ray’s Granddaughter Susan Pate arranged for my wife Rosalie and I to meet with Marjorie, which we did on 31st March. We spent a most enjoyable hour with Marjorie, who is 90, and as bright as one might hope to be themselves at that age. Marjorie told us that her Father was a member of the Masonic Lodge, and that he was selling raffle tickets for the lodge in the Riversdale Hotel in Hawthorn in December 1941 to raise funds for a children’s Christmas party. It was this event that led to the conversation between Ray and his friends, Alf Clark, Clarrie Williams and Jock McAdam, that resulted in the formation of Uncle Bobs Club on 3rd January, 1942. Marjorie also told us that her Father had made a business trip for RMS to NSW in the late 40’s. Whilst away he contracted appendicitis, which developed into peritonitis. On his eventual return to Melbourne he decided, due to his health problems, to sell his share of the business to Mr. Alf Clark, and retire. This also led to his reduced involvement in Club activities. 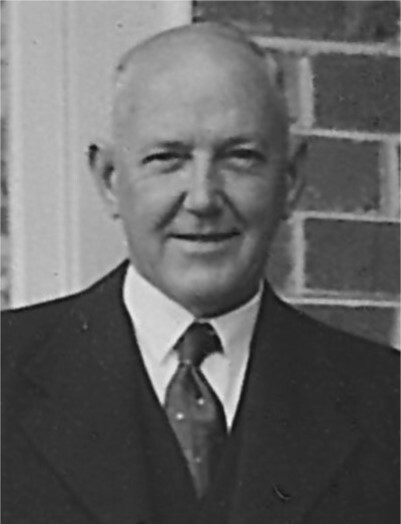 Ray served on the committee from 1942 to 1948. He was Vice President in 1942, and President in 1943. At the Club’s General Meeting of 12th February 1958 members were advised that the Air Conditioning of the 0perating Theatre and the Audiometry Centre at the Royal Children’s Hospital were to be officially handed over on 20th February, and that the Audiometry Centre project would be named in honour of Raymond Eric Fisher. Ray was awarded Honorary Life Membership of the Club in 1965. Mr Fisher passed away at his home in Camberwell on 3rd December, 1965 aged 71. Ray’s widow Elsie passed away in April 1982 aged 88. Our thanks to Ray’s Granddaughter Susan Pate for arranging for us to meet her Mother Marjorie, sending us the photo of her Grandfather, and her contribution to this article, and to Marjorie for sharing some of her memories of her Father with us. Thank you your research in finding this 4th founder. This added to the details of the other 3 makes it so much better in us volunteers telling others of the history of UBC. It is nice to have a missing gap in our History Filled.